We’d love your help. Let us know what’s wrong with this preview of The Lycian Shore by Freya Stark. Freya Stark, along with Gertrude Bell, was the greatest woman traveller of the 20th century - she was also one of the finest travel writers and inspired a whole generation who followed her. Here, she combines her sense of adventure with a unique eye for history and landscape. 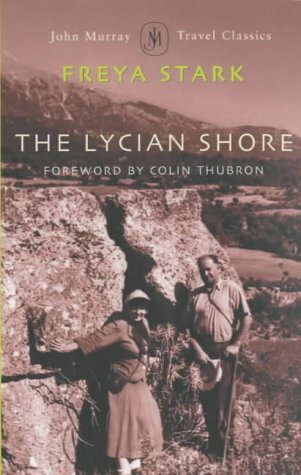 To ask other readers questions about The Lycian Shore, please sign up. Brambles, the prickly holly-oak and spiky thickets of acacia grew thick as we reached the ruins where the city streets once led. A Roman bath with brick outlines to its arches fed a tree on its high wall; near it stood a small temple, with four fluted engaged columns and a door between them. All here was hard to reach because of growing trees, and barriers of thorns laid to keep the cattle in small enclosures. We struggled, scratched and bruised, and lost ourselves and each other, and finally emerged over the blocks of a fallen scene into a grey stone theatre, roughened and mossed over by time. My first Freya Stark, an author I've been longing to read. Unfortunately, from what I gather, this isn't the most accessible or representative book of her writings. She is mostly writing about 3th and 4th century BC Greece. On this (mostly) boat journey she is usually referencing scholarly works in relation to the sites she is visiting. Unless you're somewhat knowledgeable in the history and characters it's a struggle to get much out of it. She doesn't offer much context or explanations. While I'm My first Freya Stark, an author I've been longing to read. She is mostly writing about 3th and 4th century BC Greece. On this (mostly) boat journey she is usually referencing scholarly works in relation to the sites she is visiting. Unless you're somewhat knowledgeable in the history and characters it's a struggle to get much out of it. She doesn't offer much context or explanations. While I'm interested in the subject, I glossed over much of it. Having said that, there were some things I found interesting and when she delved into describing the voyage and sites themselves and some of her inner thoughts it becomes a much more engaging read. I definitely want to read more by her. I believe it's her Arabian travels that she's highly regarded for. An interesting overview of Freya’s journey, and much better than Balfour’s recounting of the same trip. Freya displays her customary genuine passion for history and her interest in those she encounters while travelling, resulting in a wonderful blend of old and new storytelling. This particular book gets a bit esoteric at times, though it’s generally enjoyable and adds nicely to the travellers history of this fascinating coast. Last winter (2006) I read her Ionia, which I had picked up at the Seattle Public Library Book Sale, and really loved it. I put it off for a long time because I don’t really like travel writing, but it’s more history than anything, and she’s a brilliant and emotive writer. When I saw she had written on Lycia, I had to seek it out, as it’s one of my minor obsessions. The Lycian Shore, in modern parlance, is entirely made of awesome. By Hermoine Ranfurly. They met during WW2. In her lifetime she was famous for her experiences in the Middle East, her writing and her cartography. Freya Stark was not only one of the first Western women to travel through the Arabian deserts (Hadhramaut), she often Freya Stark was born in Paris, where her parents were studying art. Her mother, Flora, was an Italian of Polish/German descent; her father, Robert, an English painter from Devon.